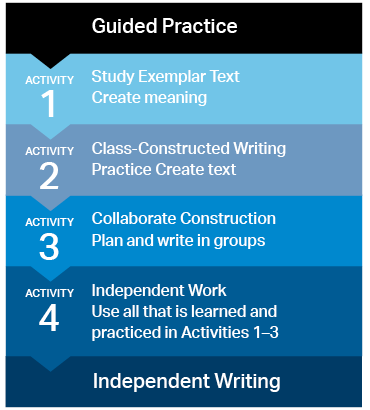 The SpringBoard English Language Arts curriculum includes writing activities in every unit. We also offer Writing Workshops, which can supplement the SpringBoard program as extra support or be used on their own. The ability to write fluently in different genres and to use research, evaluate evidence, and support arguments in writing are essential college and career readiness skills. SpringBoard English Language Arts includes writing instruction in activities in every unit. We also offer stand-alone Writing Workshops with Grammar Activities—10 per grade level—for a deep dive into this skill. These workshops focus on the practice and mastery of the writing process and specific writing modes. Teachers use our Writing Workshops both to help students struggling with writing and to challenge advanced students to go further. The Writing Workshops lead students through structured writing activities and give them learning strategies that will help them complete the activity. The activities contain opportunities for group and teacher feedback, and culminate in each student producing a piece of independent writing. The workshops can be taught in any order. You can teach elements of a workshop as single, 45-minute lessons, or teach the entire workshop of 10 activities as a weeklong minicourse. The workshops include companion grammar activities that address grammar, usage, style, and mechanics. The workshops focus on specific rhetorical, grammar, and usage skills. For example, there are separate workshops on expository writing, narrative writing, and argumentative writing for each grade level. Students study an exemplar text. The teacher guides the class in writing a text together. Students then form smaller groups to plan and write a text. Finally, each student writes a text independently. During the workshop, students are guided through pre-writing, drafting, editing, researching (if applicable) and other steps. Features such as Academic Vocabulary callouts and Check Your Understanding formative assessments help them master key concepts. As in every SpringBoard course, teacher support is embedded in the Teacher Edition of the workshops. This includes guidance on the Plan-Teach-Assess-Adapt model, as well as Teacher to Teacher and Differentiating Instruction callouts. Go to Sample Activities to download samples of Writing Workshops that you can use in your classroom.